Plan your issues over time, assign dead lines and sales targets. Search for and select the magazine channel you want to work with. In tab named Issues you can find any planned issues for your selected magazine. If you want to display your issues the way they are planned over time, sort the information by Production date by clicking the little arrow (green box). The reason for this is that in order to sell an ad in the 2019 October issue (for example), that issue need to exist in RunMags. Likewise, in order to sell a one year, 12 issues subscription, each and every one of those future issues need to exist before you create the subscription sales order. If they don't exist, RunMags will not calculate the sales order correctly and your distribution will be off. To add a new issue, click the green New button. To edit an existing issue, click the orange Edit button or double-click the issue. The following form will be displayed. Publication date is the date when the issue is officially released to the public. Adv. deadline date is the last date an ad can be booked in that issue. A sales rep can override this date if necessary when closing a deal. Artwork deadline date is the last date that artwork need to be received by. This date is used for artwork reminder emails. Editorial deadline date is the last date that editorial content need to be received by. This date is used for editorial reminder emails. Subscription deadline date is the last date someone can subscribe to the magazine and still be able to receive this specific issue. 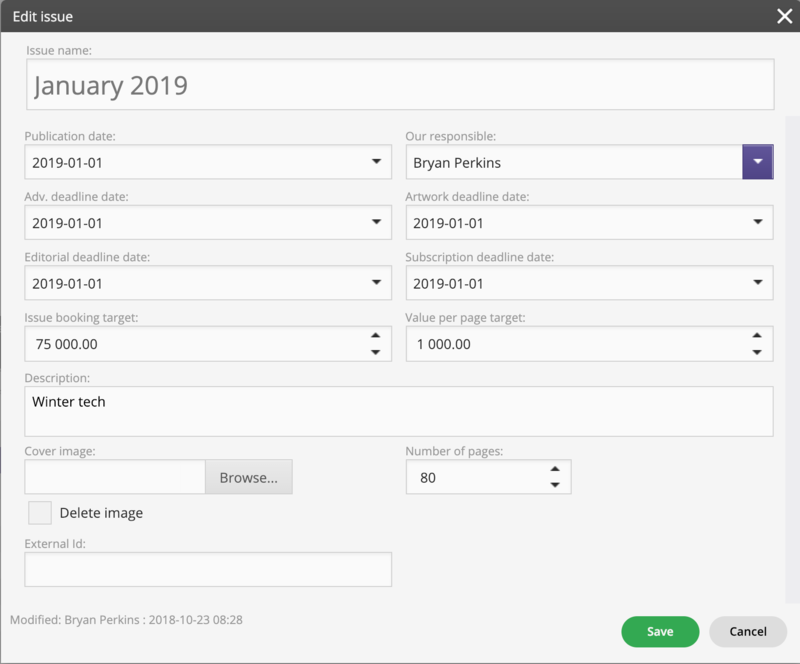 Issue booking target is the monetary value ($, £, kr, etc per your set up) that will be used in dashboards to display how actual sales is coming in relationship to the target set. 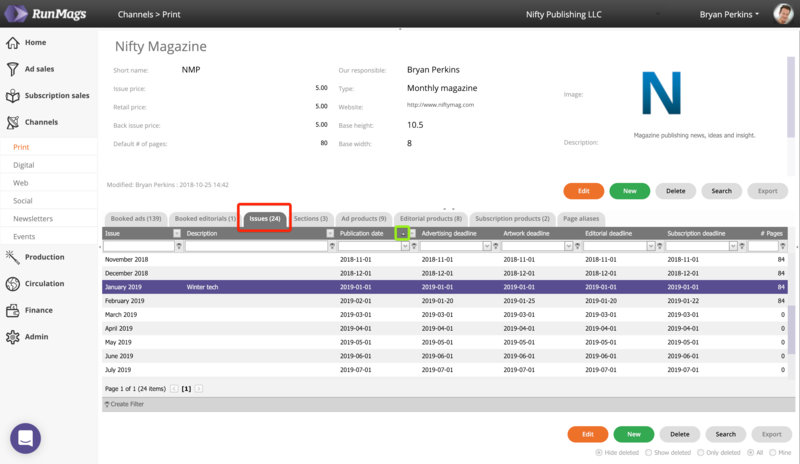 To calculate the actual sales per issue, RunMags summarized the total amount of sold ads for the specific issue. Value per page target is the monetary value ($, £, kr, etc per your set up) that will be used in dashboards to display how actual sales is coming in relationship to the target set. To calculate the actual sales per page, RunMags summarizes the total amount of sold ads for the specific issue and divides it with the number of pages that are included in the flatplan. Click save when all the information has been entered.